Renowned torture enthusiast and perennial Israel apologist Alan Dershowitz was in Tel Aviv this month attending an annual business conference sponsored by Globes and, as usual, took the opportunity to equivocate for Israeli espionage, defend war criminals, and warmonger about Iran. Like everything else The Dersh says, his statements are clearly out of step with the basic tenets of international law and, unsurprisingly, ignore both historical facts and current reality in order to draw his despicable and dubious conclusions. To understand Dershowitz’s warped concepts of morality, one can simply read his justifications for the murder of civilians, as long as they’re Arabs and/or Muslims. First of all, the premise of Dershowitz’s appalling argument regarding an Israeli attack is the assumption that Iran is, in fact, hellbent on building nuclear weapons and threatening Israel with genocidal annihilation. Of course, neither claim is true. Both the IAEA and the United States government (after years of covert operations and aerial surveillance) continue to agree that Iran does not have an active nuclear weapons program. In early 2011, Director of National Intelligence James Clapper told both houses of Congress, “We continue to assess Iran is keeping open the option to develop nuclear weapons in part by developing various nuclear capabilities that better position it to produce such weapons, should it choose to do so. We do not know, however, if Iran will eventually decide to build nuclear weapons.” Dershowitz’s insistence that the summary execution of Iranian scientists can be “justified morally” demonstrates the depths of his depravity. Furthermore, so-called “preemptive” military attacks are illegal and explicitly forbidden by Chapter I, Article 2.4 of the United Nations Charter. The UN Charter also makes clear that it recognizes the “inherent right of individual or collective self-defence if an armed attack occurs against a Member of the United Nations.” (Chapter VII, Article 51) Note that the Charter specifies that an aggressive, military response is allowed only “if an armed attack occurs…,” which undoubtedly rules out “preemptive,” “precautionary,” or “preventative” military action of one State against another. Dershowitz conveniently ignores this clear fact. 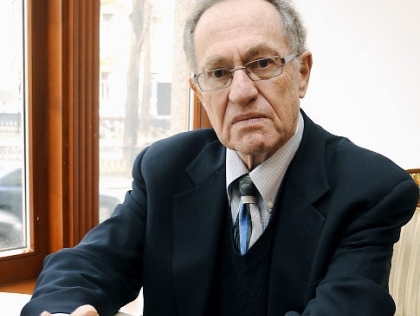 What Dershowitz omits from his ridiculous suggestion is that the Israeli attack, code named Operation Opera, took the lives of ten Iraqi soldiers and one French civilian researcher and was widely lambasted by the International Atomic Energy Agency (IAEA) and the international community, including the United States. “Armed attack in such circumstances cannot be justified. It represents a grave breach of international law,” Margaret Thatcher thundered. Jeane Kirkpatrick, the US ambassador to the UN and as stern a lecturer as Britain’s then prime minister, described it as “shocking” and compared it to the Soviet invasion of Afghanistan. American newspapers were as fulsome. “Israel’s sneak attack… was an act of inexcusable and short-sighted aggression,” said the New York Times. The Los Angeles Times called it “state-sponsored terrorism”. Nonetheless, we believe the means Israel chose to quiet its fears about the purposes of Iraq’s nuclear program have hurt, and not helped, the peace and security of the area. In my Government’s view, diplomatic means available to Israel had not been exhausted and the Israeli action has damaged the regional confidence that is essential for the peace process to go forward. All of us with an interest in peace, freedom and national independence have a high stake in that process. Israel’s stake is highest of all. Furthermore, the General Assembly demanded that “Israel, in view of its international responsibility for its act of aggression, pay prompt and adequate compensation for the material damage and loss of life suffered” due to the illegal and lethal attack. Only the United States and Israel voted against the resolution. In August 2002, Mary Ellen O’Connell, law professor at the Moritz College of Law and Associate of the Mershon Center for International Security and Public Policy at Ohio State University, wrote an extensive analysis entitled “The Myth of Preemptive Self-Defense” for the American Society of International Law (ASIL) Task Force on Terrorism wherein she explicitly addresses the very misconception Dershowitz is attempting to put forward. “Preemptive self-defense,” O’Connell writes, “is clearly unlawful under international law.” She explains, “The right of self-defense is limited to the right to use force to repel an attack in progress, to prevent future enemy attacks following an initial attack, or to reverse the consequences of an enemy attack, such as ending an occupation” and also points out that “the United States as a government has consistently supported the prohibition on such preemptive use of force.” O’Connell continues, “the reality is that the United States has no right to use force to prevent possible, as distinct from actual, armed attacks. The further reality is that the United States does not advance its security or its moral standing in the world by doing so.” Throughout her paper, O’Connell stresses that all nations are bound by these same rules. The preemptive use of military force would establish a precedent that the United States has worked against since 1945. Preemptive self-defense would provide legal justification for Pakistan to attack India, for Iran to attack Iraq, for Russia to attack Georgia, for Azerbaijan to attack Armenia, for North Korea to attack South Korea, and so on. Any state that believes another regime poses a possible future threat— regardless of the evidence — could cite the United States invasion of Iraq. In defending Israel’s “right” to commit what the International Military Tribunal at Nuremberg described as “the supreme international crime” – namely, the willful initiation of a “war of aggression” – against Iran, Dershowitz also ignores the salient fact that the consequence of the Israeli bombing of Osirak was actually exactly the opposite of the stated goal of the operation. It was only after the Israeli attack that Iraq embarked on a nuclear weapons program. Mary Ellen O’Connell defines “anticipatory self-defense” as “armed responses to attacks that are on the brink of launch, or where an enemy attack has already occurred and the victim learns more attacks are planned.” Clearly, as Israel was in no imminent danger of being attacked in 1981 by Iraqi nuclear weapons which didn’t exist, Begin’s triumphant boast was nothing more than a propagandistic lie. The neoconservative, AIPAC-driven rhetoric, echoed consistently by Dershowitz, warning of the existential threat now posed to Israel by Iran is an updated example of this very same falsehood. We chose this moment: now, not later, because later may be too late, perhaps forever. And if we stood by idly, two, three years, at the most four years, and Saddam Hussein would have produced his three, four, five bombs.… Then, this country and this people would have been lost, after the Holocaust. Another Holocaust would have happened in the history of the Jewish people. Never again, never again! Tell so your friends, tell anyone you meet, we shall defend our people with all the means at our disposal. We shall not allow any enemy to develop weapons of mass destruction turned against us. The countdown to an imaginary Iraqi and Iranian nuclear bomb is a three-decade-old staple of Israeli and American fear-mongering. Naturally, the exploitation of Holocaust analogies and endless Hitler comparisons is all part of the routine, along with ad nauseum repetitions of long-debunked mistranslations of cartographic proportions. The world ignored the explicit threats of one tyrant who threatened to destroy the Jewish people in the 1930s, and he nearly succeeded in the 1940s. Israel cannot be expected to ignore Hitler’s successor, who while denying the first Holocaust, threatens a second one. Dershowitz’s own usage of Menachem Begin’s “Never Again” nonsense should come as no surprise considering The Dersh’s obvious affinity for plagiarizing propaganda. It is no wonder that Dershowitz treats the Osirak attack as a successful and necessary mission to be emulated, if not overtly duplicated, with regard to Iran. The reason is that Israel never pays a price for its constant contravention of international law, denial of human rights, and indifference to, if not outright contempt for, any human life that doesn’t fully support ethnic cleansing, apartheid, colonization, occupation, and institutionalized racism and discrimination against a displaced, dispossessed, devastated and demonized indigenous population. Clearly, Israel has never followed through with its obligations as determined by the UN Security Council in 1981 and has continued to act aggressively and criminally ever since, with complete impunity and diplomatic protection from its superpower patron. The supposed “moral right” Dershowitz ascribes to an unprovoked and illegal Israeli attack on Iran – a sovereign nation of nearly 74 million people whose government consistently declares it has no intention of building a nuclear weapon or starting a war against the region’s strongest military – isn’t even worth discussing. With his noxious comments in Tel Aviv, as with most everything else he says, writes, and does, Alan Dershowitz has once again revealed himself to be incapable of telling the truth or demonstrating even the most basic elements of reason or humanity in his obsessive determination to defend, and in this case encourage new, Israeli war crimes.